Dirawong Reserve is a 300 ha crown reserve for the conservation of Aboriginal cultural heritage, flora and fauna and recreation, Located on the southern peninsula of the river mouth adjoining the village of Evans Head in Northern NSW, the reserve includes beach areas, frontal dunes, cliff faces, coastal heath and ti tree swamp. The reserve is managed by the Dirawong Reserve Trust, which is committed to implementing its Plan of Management by upholding the values of Indigenous heritage and improving restoration of the natural environment through strategic and continuous projects. 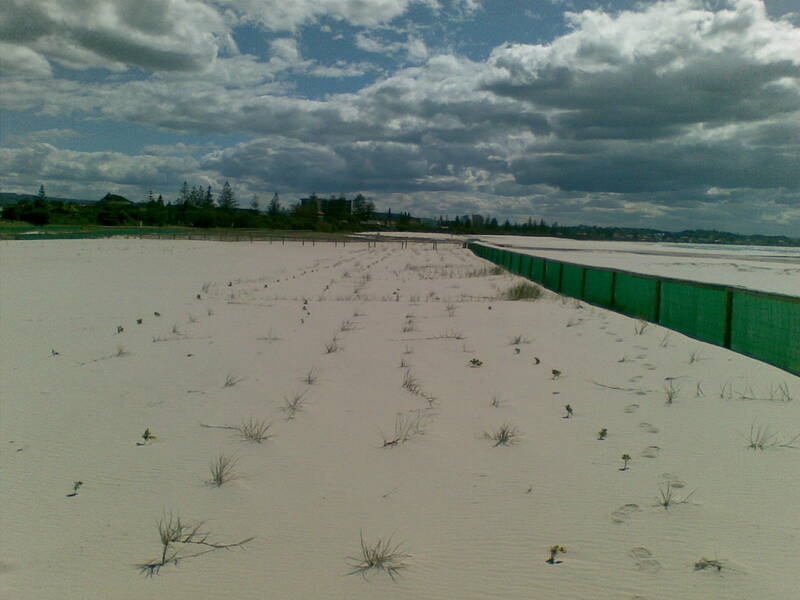 The coastal zone, largely involving coastal strand plant, dune, heath and grassland communities, has been subject to a range of impacts including sand mining, off-road driving and weed invasion over half a century, leading to high levels of weed dominance. Bush regeneration works have been ongoing since the early-mid 1980s and include a combination of volunteer programs and engagement of contractors. 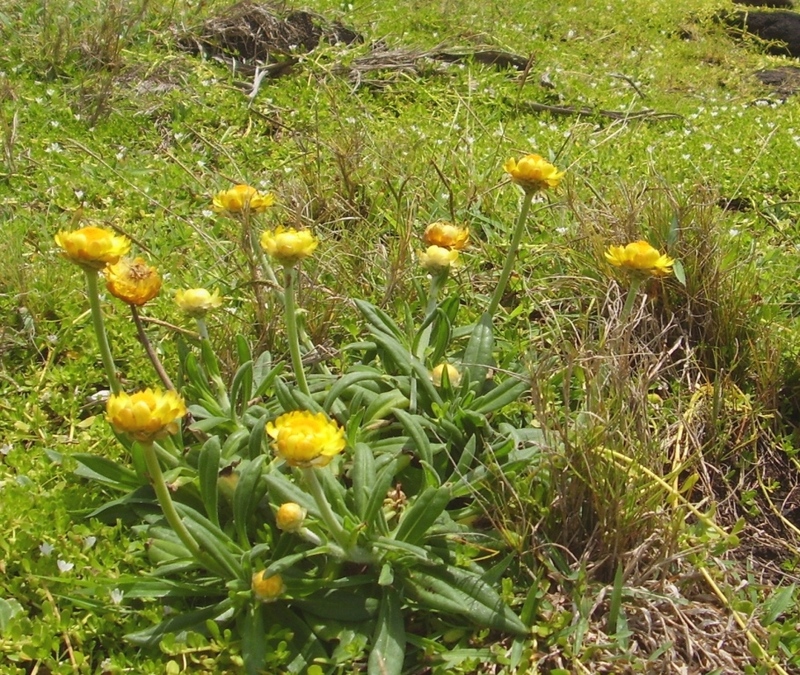 A range of innovative techniques have been used to treat Bitou Bush (Chrysanthemoides monilifera ssp. rotundata), Glory Lily (Gloriosa superb) and Coastal Tea Tree (Leptospermum laevigatum). 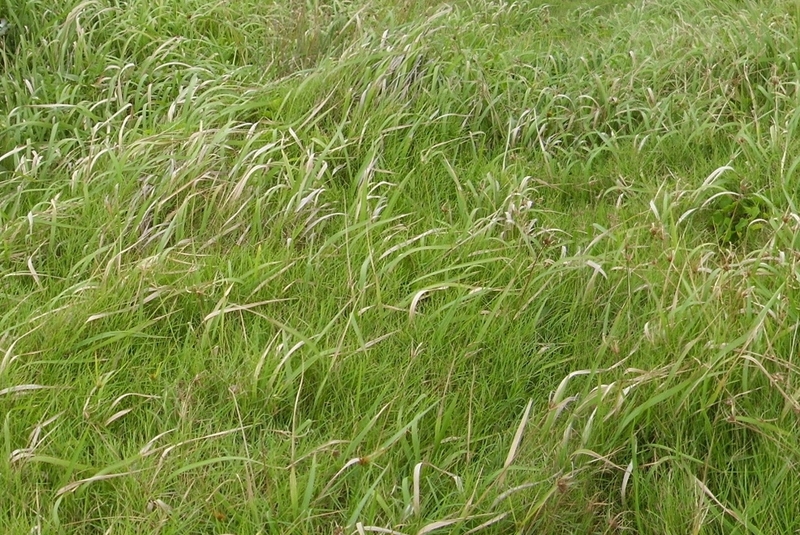 Results of the combined efforts over time has achieved the decline of weed over large areas of the site, with extensive regeneration of native vegetation. History of Indigenous community involvement. 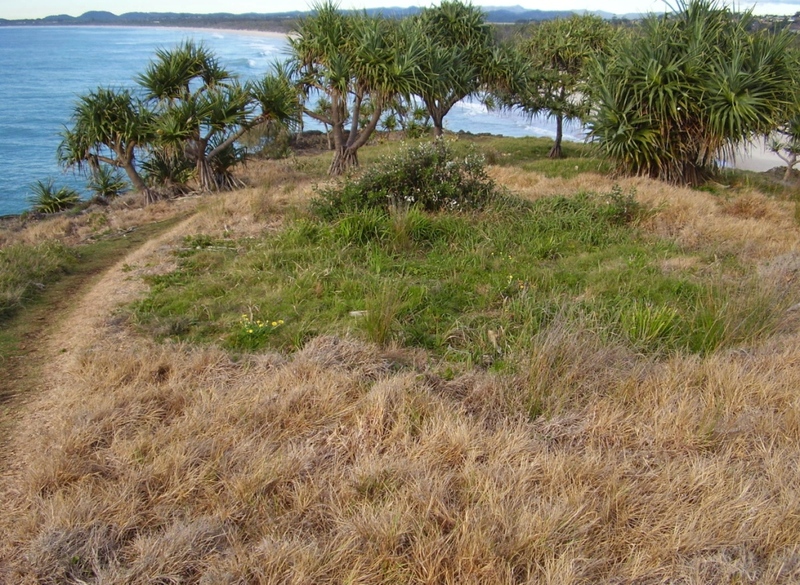 As a result of inspiration gained from the highly successful employment of Indigenous Rangers during the 1970s at the nearby Bundjalung Flora and Fauna Reserve (now Bundjalung National Park), local Bundjalung community members were employed on a casual basis at Dirawong Reserve during the 1980s and 1990s. Experienced supervision and training was provided for the bush regeneration works, which focused on control of Bitou Bush, using manual techniques. As part of the program, elders from the Bandjalang community worked alongside younger workers, passing on both Traditional Ecological Knowledge and culture relating to this important site. The Trust, which is made up of representatives including from the local Bandjalang clan Traditional Owner group, has a policy of seeking Traditional Owner personnel for any contracts that come up in the future. Such employment would mean that four generations of Indigenous natural resource management workers will have been directly involved in managing Dirawong Reserve over the last three decades. Recent works. 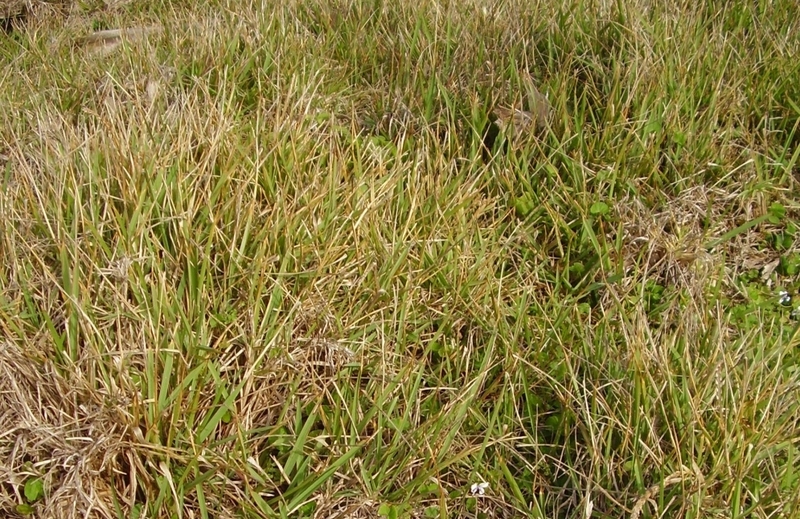 To complement ongoing regeneration projects, recent (three-year) funding through the NSW Government Environmental Trust Program has allowed Dirawong Reserve Trust to engage contractors to manage the continuation of the project, applying a range of both standard and Dirawong Reserve’s own innovative techniques to treat Bitou Bush, Glory Lily and Coastal Tea Tree among other weeds. One successful innovation, developed in the 1990s by the site’s long time regeneration advisor, Ellen White, has been the cutting of Coastal Tea Tree below the lowest branch or cutting off all branches, which has proven to be sufficient to kill the plant.. This method eliminates the need to use herbicides and reduces strain for operators. 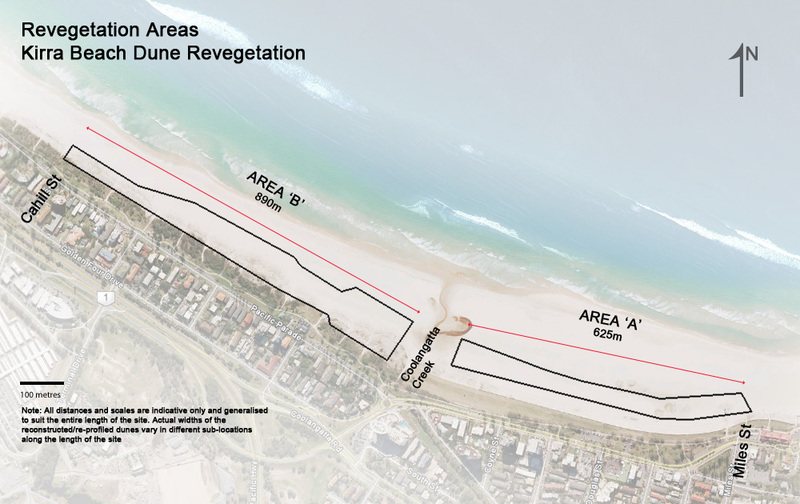 This has been applied at other areas of the headland more recently, using chainsaws. To assist with the ongoing and long term work of treating Bitou Bush, the Trust has engaged a specialist abseiling bush regen team to spot spray or cut and paint Bitou Bush in difficult locations such as cliff faces. (See photos above). Results to date. Progress has been steady and highly effective over recent decades, although there is much work remaining, in terms of Glory Lily follow up and there are still substantial areas of Bitou Bush to treat. To date, Coastal Tea Tree works have been carried out over 12 ha, with no sign of resprouting from cut stumps in any age class. (See photos of some of the recent works above). 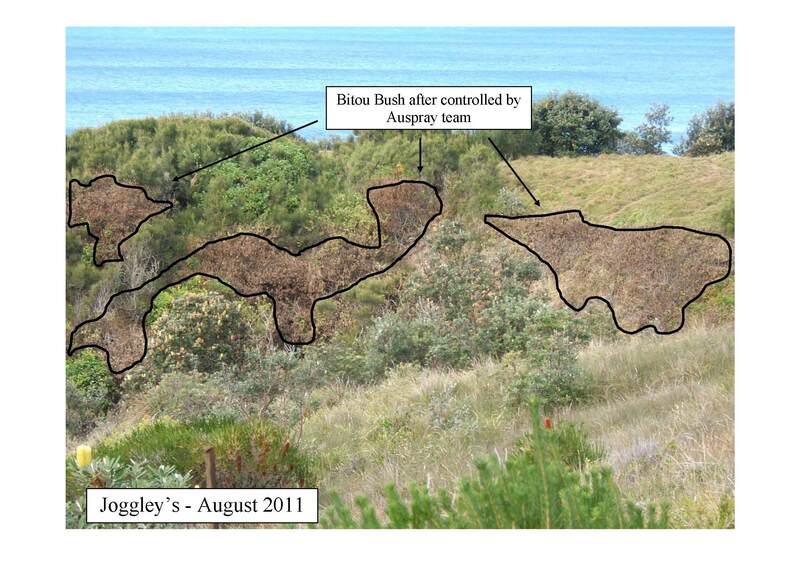 Treatment of cliff faces by abseiling contractors has resulted in effective treatment of Bitou Bush with no significant off-target damage (see photos below). No soil destabilisation has been generated from the works. 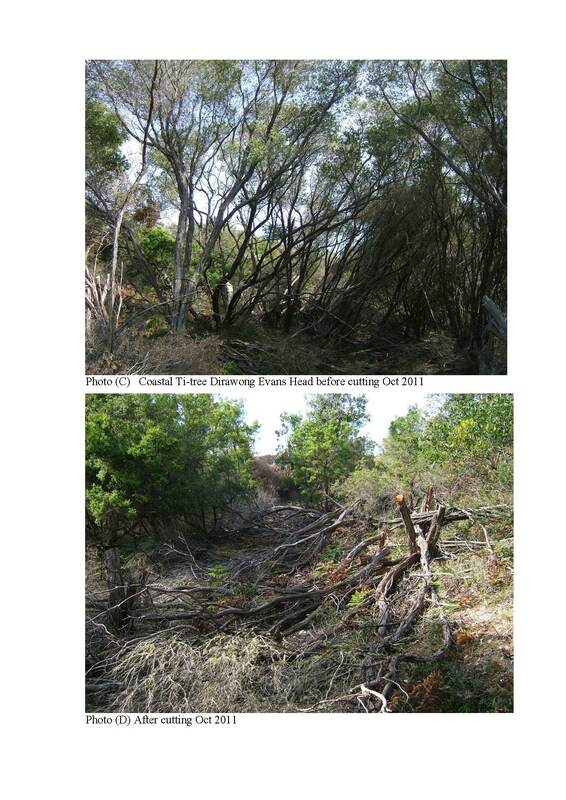 Before (c) and after (d) cutting of Coastal Ti-tree. All photos: B Jarman. Acknowledgements: Funding has been received from a range of sources, most recently the NSW Government’s Environmental Trust Program. We also acknowledge the dedicated work of our bush regeneration volunteers and committee members over the decades since the mid 1980s. Contact: Dirrawong Trust, P.O. Box 90, Evans Head, NSW 2473, Australia. Email: dirawong.trust@gmail.com. Over the past 50+ years, more than 5,000 ha of seagrass has been lost along the Adelaide metropolitan coast, largely due to excessive nutrient inputs. Following substantial investment in reducing nutrient inputs, limited natural recolonisation has been observed. This is possibly due to sediments now mostly being too mobile for seagrasses to colonise. The trial. 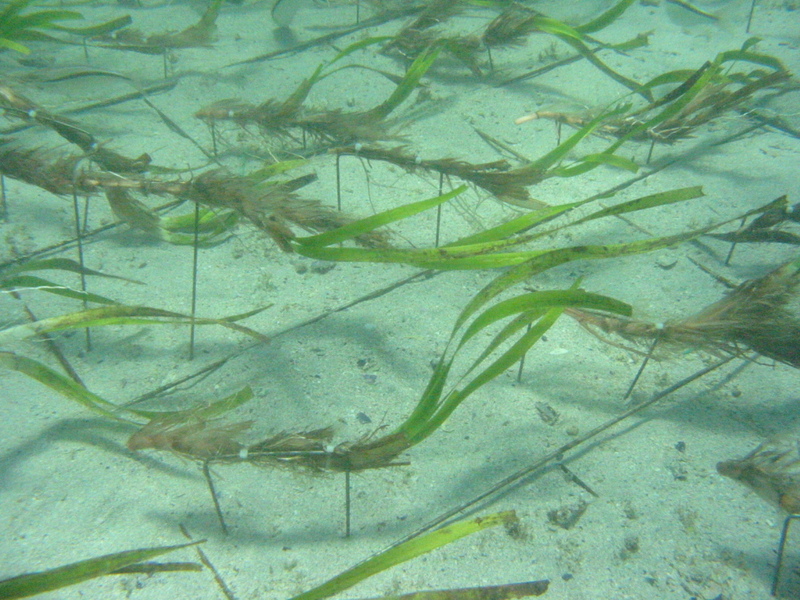 An experiment was carried out to stabilize areas adjacent to existing seagrass meadows, deploying hessian sand bags to provide a stable substrate for the recruitment of Amphibolis seedlings. These seedlings are produced viviparously by the parent plant and have a ‘grappling hook’ for attachment to the substrate. Various types of sand bag were trialed, with the most effective being a standard hessian bag covered with an outer layer of coarse-weave hessian. 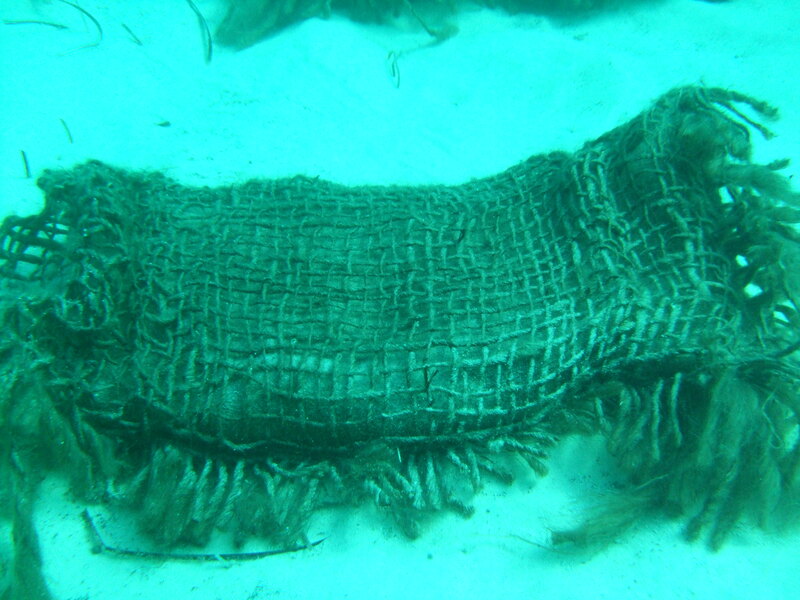 These bags can simply be dropped over the side of a boat, and do not require divers to deploy them, thus substantially reducing the coast of restoration. Densities of recruits averaged 150-350 seedlings per m² for different treatments, with individual sand bags attracting densities up to ~900 seedlings per m². Long-term survival (i.e. 3 years or more) occurred for up to 72 individuals per m², although many treatments failed over this duration. Preliminary estimates suggest that restoration costs could be less than $10,000 per ha, provided that long-term success and eventual meadow formation can be achieved. Initial studies of the bags suggested that spatial configuration was not important. WATCH VIDEO Fig. 3. 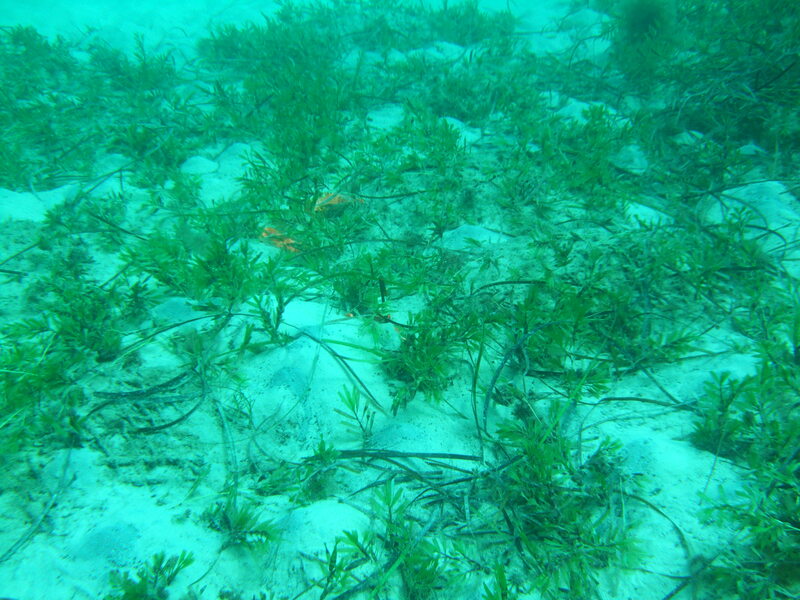 Video of a 3-year-old and adjacent 4-year-old zone where hessian sand bags were deployed showing seagrass colonisation in the older seagrass. UPDATE FEBRUARY 2016: Re-established Ampibolis at 3 years remains interspersed with patches of bare, highly bioturbated, sand. 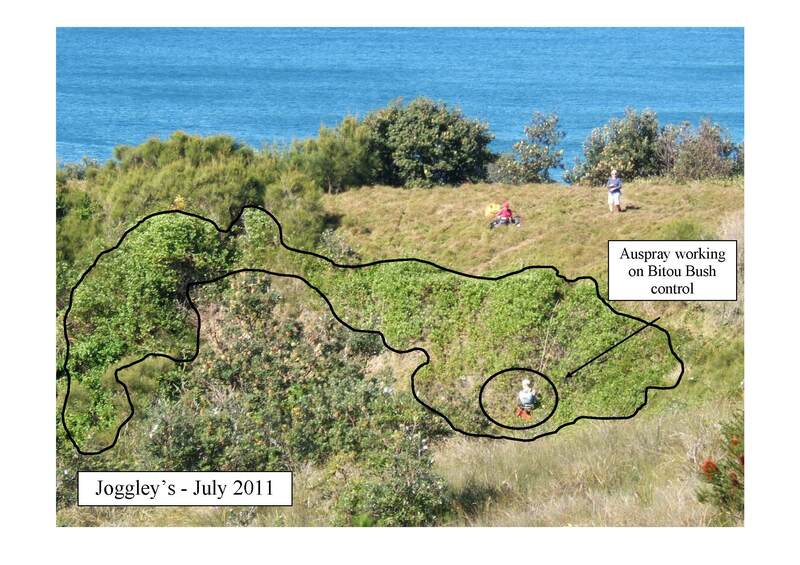 The first ~45 seconds of the video in Figure 3 is a section ~3 years old, where seagrass has not colonised the space between the bags that were deployed, while the remainder is ~4 years old, and the spaces between bags have been colonised. Natural recruits of Zostera species are prominent in the first 20 seconds. In other areas, Posidonia is recruiting, indicating that biodiversity is building over time as a result of the treatments. Lessons learned and future directions: The key issue so far has been the inconsistent quality of the hessian used for the bags – some batches deteriorate rapidly leading to loss of all seedlings, whereas others last longer. The focus is now on trialling nanotechnology to improve the hessian longevity, while still retaining its long-term biodegradability. There is some suggestion that half-buried bags also perform better, possibly due to water flow through the sand in the bags, and this needs further study. On Clean Up Australia Day 2011, NQ Dry Tropics hosted a new event called Celebrate the Sea Festival in Townsville to promote National Seaweek. The aim of the event was to place a spotlight on the achievements of local environment groups and marine scientists. Residents were invited to contribute towards creating a more sustainable future on their local beach of Pallarenda in a practical way. The 146 volunteers removed 52 bags of rubbish that were destined to become deadly marine debris. All volunteers of the clean up were rewarded with a free BBQ lunch, educational activities including a bush tucker walk and marine scientist presentations. Seven experts spoke about sea turtle conservation, our changing climate, wetlands, creating sustainable behaviour changes and permaculture design. The presenters were from organisations including James Cook University, Reef and Rainforest Research Centre and Marine Wildlife Australia. Seven environment groups had displays and ran educational activities for both young and old. Additional awareness was raised through television and radio interviews on the day and NQ Dry Tropics’ events leading up to the Festival. 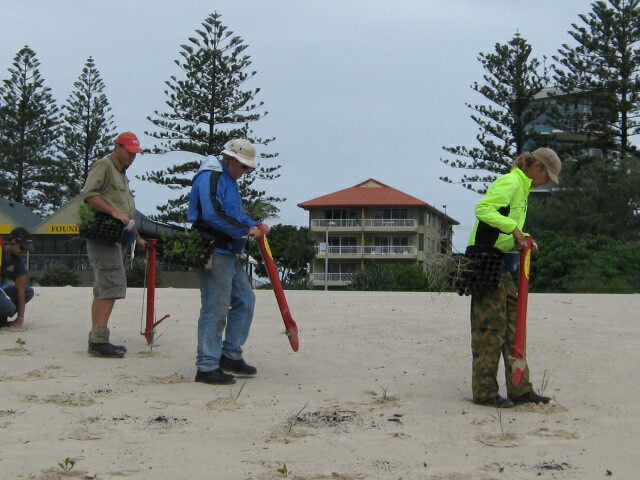 NQ Dry Tropics’ Laura Dunstan spoke about marine debris in four television and three radio interviews. Children grabbed their chance to hug and talk to three giant mascots including NQ Dry Tropics’ favourite employees, Duey the dugong and Tiny the Tern. 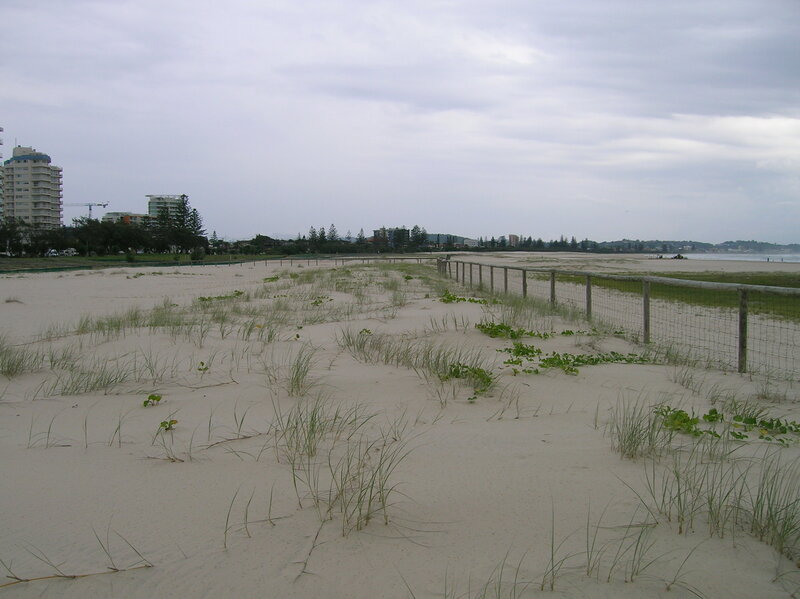 Duey asked people to protect their precious seagrass and to slow down and look out for dugongs when boating. Tiny’s concern is protecting precious nests on beaches. Reef HQ’s Lucky T Turtle sold the ‘say no to plastic bags’ message and the ‘4 R’s of rubbish – refuse, reduce, reuse and recycle’. The Celebrate the Sea Festival inspired and educated residents about marine science and conservation and encouraged environment groups to collaborate and learn collectively. Its success has meant that NQ Dry Tropics is keen to host Celebrate the Sea Festival in 2012. Donations towards the event were kindly supplied by Bunnings, Ergon Energy, Doug Edes Party Hire, local food suppliers and the environment groups that exhibited including Conservation Volunteers Australia, Reef HQ Great Barrier Reef Aquarium, Marine Wildlife Australia, Permaculture Townsville, Sea Turtle Foundation, Coastal Dry Tropics Landcare Inc and NQ Fly Fishing.